Some Vintage Shop and Oh, Deer! Projects for you! Hello My Little Shoebox fans! Today it's my turn to show you what I made with My Little Shoebox' awesome collections! As I wasn't able to choose between my 2 favorite collections: Vintage Shop and Oh, Deer! I decided to create something with both of them! I don't know if you can see it very well, but he has blue hairgel in his hair and was feeling very "tough"! Although "tough" and Vintage Shop don't seem a likely combination I decided to go for it anyway and am quite happy with the result! Supplies: My Little Shoebox: Vintage Shop collection (patterned papers, 3D Roll-Up Flowers and Accents, Cardstock Stickers), Muse Cardstock Alphabet Stickers, Mini Alphabet Stickers, Unity Stamp & My Little Shoebox: Owl love You Always. Other supplies: Cardstock: Bazzill Basics; Heart Jewel: Doodlebug Design; Stamps: Studio Calico, Stampers Anonymous; Stamping Ink: Memento; Pen: K&Company; Doily and Staples: misc. Tools: Silouette Cameo. I'm so in love with the little deer! I just had to use them! Supplies: My Little Shoebox: Oh, Deer! (Patterned Paper, 3D Roll-Up Flowers and Accents, Cardstock Stickers), Muse Cardstock Alphabet Stickers, Mini Alphabet Stickers. Other supplies: Cardstock: Bazzill Basics; Pen: Stabilo; Doily: misc. Although this is not quite my last post on MLS' blog, as at the end of the month I have a fun tutorial up, I do want to seize this opportunity to thank Helen from the bottom of my heart for this fabulous year on the design team. I've loved every minute creating with her awesome collections and am very sad to have to say goodbye. I'm wishing her loads of good luck and success with her new bags and accessories collections! I'm sure they will be a big hit as they are truly wonderful! Also many thanks to Shemaine and Pattie for their continuing and enthusiastic support! Thank you so much for visiting My Little Shoebox' blog today! Hope to see you back soon! Hello, MLS friends! It's Robyn with you today for a Tuesday Tutorial. Just a few more days 'til Valentine's Day. What?! You've forgotten to pick up gifts? That's okay. Today's tutorial will help you whip up a quick batch of gifts for your sweethearts. Everyone loves a gift card to their favorite store. Why not package this simple (and fast!) gift in a beautiful way? First, seal your envelopes. Then use your paper trimmer to trim a little off the short edge. I cut mine down to 5". Now that you've got your pouch, use a circle punch to cut a rounded sliver out of the top of each one. Next, insert the pouch into an embossing folder and run it through your Cuttlebug, Big Shot or other embossing machine. If you're not into embossing, you can skip this step. I just like the texture it adds to the pouch. Now you're ready to layer on some embellishments! I used banner pieces from the die-cut sheet and a few cardstock stickers to finish off this gift card holder. Repeat on the other gift card holders. 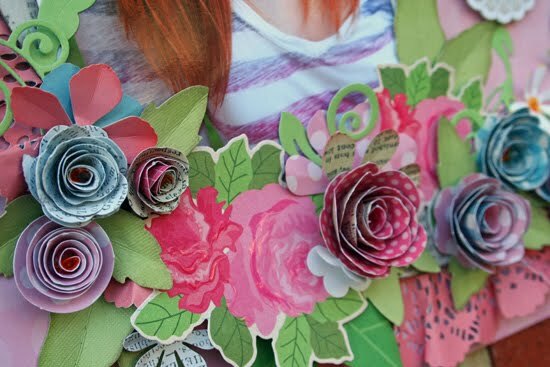 Try mixing it up a bit or adding in scraps of patterned papers or a strand of trim. And then you're ready to insert your gift cards for the ones you love. Hello, MLS friends! I'm happy to share my latest projects with the "Vintage Shop" collection. What could be better to welcome a baby girl than a card with flowers, lace, and bling? Say "thank you" to all of the wonderful people in your life. I picked up this sweet little wooden tray at a local thrift store and couldn't wait to alter it. I just love how it has transformed into dimensional wall art. Thank you for visiting the blog today! Come by each and every day for more design team inspiration. Good morning, I am squeezing in a little more Christmas magic for todays tutorial. These little angels are fun to make and can be made to stand on a side or hung on the tree. First of all find a small circular shape to draw around on some pattern paper. I used an old feeding bowl! Choose the paper you would like to be the 'dress' and draw around on the reverse side before cutting it out. I have used Notebook - With Love paper. Next cut the circle in half. I did this by folding it in half and cutting down the score line. Ink the round edge with white pigment ink and heat emboss with gold powder. Next take one half and wrap around to make a cone shape. Take some of the gingham ribbon and sew a gathering stitch to create a circle, I have used the Coming Home Trims. Secure this over the neck of the cone. I then cut out some butterfly wings using the Xcut Decorative Die - Butterflies in the Vintage Shop - French Lace and ink the edges as before. You can use any type of butterfly die or you could freehand cut your own. I then sandwiched them together as shown below so they were stiffer. You then need to punch out two circles and add them either side of the atenna, don't forget to add the thread for hanging! Don't worry if any bits over hang as these can be trimmed off. Glue this to the back of one of the cones tucking the tip of the cone on the inside of the two circles. Roll up some of the Notebook - With Love paper to create some little arms and add to the cone. Add a Christmas greeting and some Vintage Shop 3D roll up flowers along the bottom of the greeting. Punch out some small holly leaves in the Cricket and Lagoon paper and fold in half before adding to the base of the angel. Embellish with some red adhesive stones. So there is the little Christmas Angel for you. Hello, MLS fans. 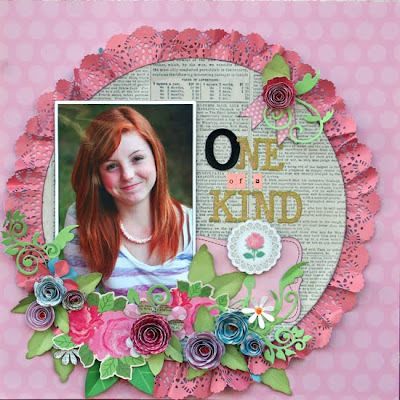 Today I want to share with you 3 layouts and 1 card, using the Vintage Shop collection. Being more a mixed media person, I decided to incorporate mixed media mediums and techniques in my projects this month. A few months ago, I purchased a digital die-cut machine, Silhouette Cameo. So I will also be using Cameo to cut some images and use in my projects as well. I loved this Vintage Shop Collection. Simply because I love vintage and I love owl image!!! Plus my favourite pink color!! For this clean card, I used Silhouette Cameo to cut out the tree card base. Then I doodled lines around the edges, add some banners at the bottom before adhere the Silhouette cut tree. For the cloud stickers, I watercolored blue tint of color by mixing a little water with Faber Castell Pitt Artist Pen. As you peek through the tree branches, you can see that I covered the inside of the card with a patterned paper and a owl sticker. I also added a journalling tag below. My favourite cardstock color is white, kraft and black as they are so versatile. So for this layout, I used black to emphasise the night flea market pictures. I painted the background and edges with white acrylic paint. Its such a simple technique to dress up a layout on a no mojo night. So you can try it out. I also teared up several strips of papers for the background. Note that I only used one piece of patterned paper here. So not only am I building a background simply with paint, I also save on the amount of papers and embellishments here. Sometimes you do not need alot of materials to create. And I loved that MLS paper gives me this option. My Little Shoe box also has some digital designs with Silhouette. So I printed these 2 flowers and sized them to my preferred size and cut them out. I used these 2 flowers as a mat for my title. To create the background, I used Unity/MLS co-branded stamps, adhered some mini alpha stickers with multi-medium and misted over with Tattered Angels mists. Then I adhered strips of papers before adding the owl frames. I also added lace and rolled flowers and mulberry flowers and pearls. I love this feminine touch. Well, we are lady owls after all! To build up the design for the edges, I adhered the Muse Cardstock Alpha Stickers and mini paper clips with multi-medium before I misted them. Then I added the mixtures of texture paste, glass bead gels and acrylic paints unto a circles mask. I layered the background with few edge-punched papers before I added photos and embellishments. Note that I added another pop up layer of Muse Cardstock Alpha Sticker for the title. I love chipboard shapes. And here, I painted randomly the mixture of texture paste, glass bead gel and acrylic paints unto the chipboard borders too. Then I added some seed beads and swarovski crystals to it. Here are more pictures of the last layout. Thats all for today. Thanks for stopping by. Hello friends. Grace here to share with you what I've created using the beautiful Vintage Shop line and celebrate Day 2 with Epiphany Crafts! I used a big chipboard shape as a template to create the shaped background from pattern paper. I misted the corrugated swirls with some glitter mist to give it more shine and match up with the girly theme of the layout. I wrapped some ribbon over glue to create my flower and then added a punched circle adorned with small pearls for the center. I added the title letters to punched circles, inked the edges and adhered it with foam adhesive to give it a floating feel which reminds me of the bubbles that my daughter was creating in the photos. 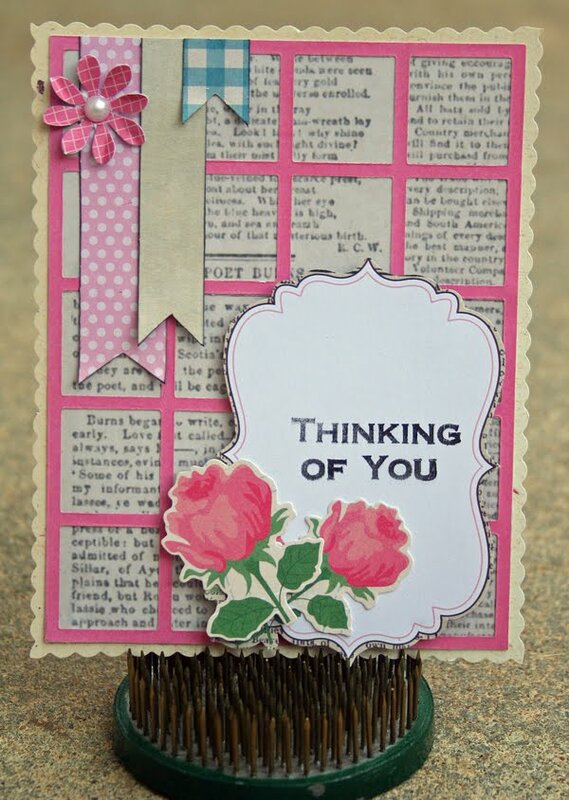 I used a lot of layering in this card and utilized the great stickers from the Vintage Shop line. I loved how with a little bit of imagination and foam adhesive, you can create a complete scene in a card. 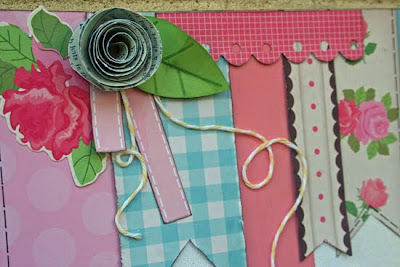 I used the strips of paper from the Rose Ribbon pattern paper as ribbons in my card. I even cut one side of one of them into a notch to mimic a ribbon. I used the rose image as my visual triangle in the card. I used the star punch and epoxy stickers to make my handmade star accents in the banner and flag. The stars remind me of the “five-star” dining that we experienced during this special dining out experience. I also used the stars as a visual triangle, leading the eye to three distinct places in the page. I used the subtle colors of the Secret Garden papers to make my dark photos stand out better. Two of my MLS team mates have also created something fun with Epiphany Crafts products today as well. Please click the links below to check out their projects posted over at their blogs. Don't forget to visit the Epiphany blog to see what their talented designers have created today as well. Hello My Little Shoebox fans! 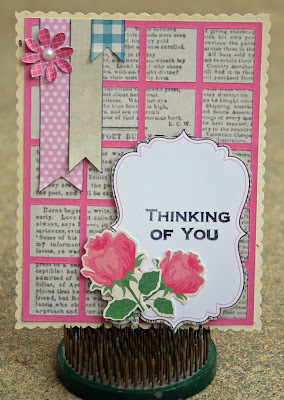 Liz here today to share a few projects with you using the adorable Vintage Shop collection. 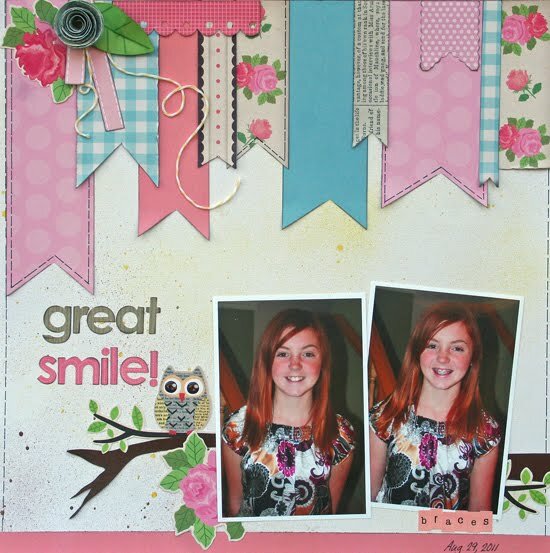 It is so easy to create eye catching projects with these cute, whimsical owl papers and stickers. This card looks like it may have taken a while to make but it didn't. I cut out faux ribbon from the Rose Ribbon sheet and stacked them to look like real ribbon. 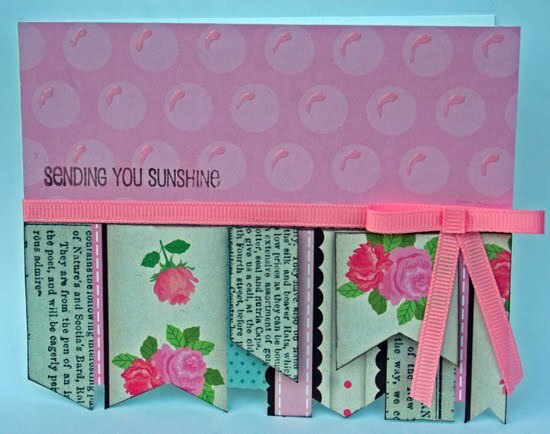 Products used: My Little Shoebox Vintage Shop Rose Ribbon and Heirloom. Hello My Little Shoebox fans! Here’s Monique today with two layouts and a card, using the brand new “Vintage Shop” collection. I am in love with owls, so you understand my excitement when I first set eyes on this collection!! Here’s my first layout about my super sweet Cocker Spaniel. I used the Silhouette Cameo to create the title, the lamp post and the clouds. How I love the colors and designs of this collection! I found this photo only a few weeks ago and I’m so happy with it I wanted to scrap it straight away. This collection is just perfect for it! 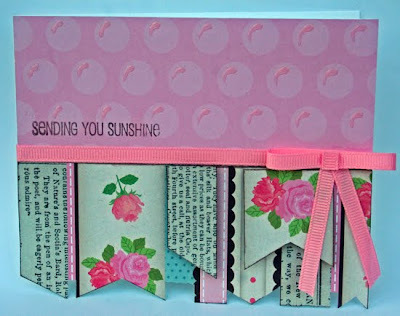 Supplies: MLS Vintage Shop: Rose Ribbon (50011), French Lace (50012, Attic Treasures (50014) and the Cardstock Stickers (50016), ML S Aiko: Kiss (11819), MLS Mini Alphabet Sticker (50153). Other supplies: White and Kraft cardstock (American Crafts), Embossed Gold (Making Memories), Feathered Flower (Webster’s Pages), Pearl (Inkido), Glimmer Mist (Tattered Angels), Words-To-Go (K&Company), Doily: Misc. I used the Silhouette Cameo to create the title and a border punch from Martha Stewart to create the row of birdies. Then last but not least I created this card; how I love those owls! The base of this card is the Kiss side from an Aiko sheet and on all 4 sides of the card I adhered a small strip of paper which I then machine stitched to the base. In the centre of the card I stitched one of the journaling cards from the Vintage Shop sheet “Attic Treasures”. I added a row of buttons, a title (cut with Silhouette Cameo), a cardstock Owl sticker (use foam adhesive for extra dimension) and finished with a banner from the Vintage Shop sheet “3D Roll-Up Flower and Accents”. Supply list: MLS Vintage Shop: Rose Ribbon (50011), French Lace (50012), Attic Treasures (50014), 3D Roll-Up Flower and Accents (50015) and the Cardstock Stickers (50016). MLS Aiko: Kiss (11819) and Happy Go Lucky: Linen (11859).Other supplies: Buttons (Misc.). This is it for today! Thanks for stopping by My Little Shoebox’ blog and hope to see you back soon!